Ebony Bizys is an Australian craft artist, designer and blogger based in Tokyo. Before moving to Tokyo in 2010, Bizys worked at Australian Vogue magazines for 11 years, most recently in the position of Deputy Art Director at Vogue Living. Since moving to Tokyo, Bizys has art directed a Japanese book, designed a Japanese fashion website, been commissioned by Vogue Japan to make artwork for their publication, collaborated with Japanese masking tape brand 'mt' on workshops, and has appeared in many Japanese books and magazines. Bizys also holds regular craft workshops, blogs for Vogue Japan and promotes Martha Stewart Crafts in Japan. In July 2012 she released a craft book with publisher BNN. She records her daily life on her hugely successful cult blog Hello Sandwich. 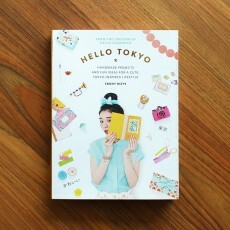 Handmade Projects and Fun Ideas for a Cute Tokyo-Inspired Lifestyle Hello Tokyo presents over..